Having a corn allergy means you miss out on a lot of popular snacks. Just about all chips are out due to the use of corn oil, maltodextrin, xanthan gum and citric acid. Popcorn is sooooo out. Most of the time even smelling popcorn is out. Which means movie theaters are often out. Sigh. So as not to feel deprived, I converted an old family favorite into a healthier gluten-free and corn-free “popcorn” treat. My mom used to make “puffed wheat” as a snack for us as kids. This meant melting some butter in a sauce pan and stirring in the puffs and sprinkling it with salt. Stir until the butter evenly coats the puffs and the puffs are warmed through. Voila! Instant salty snack. Well today, I can’t have corn or wheat (or kamut) due to my allergies. 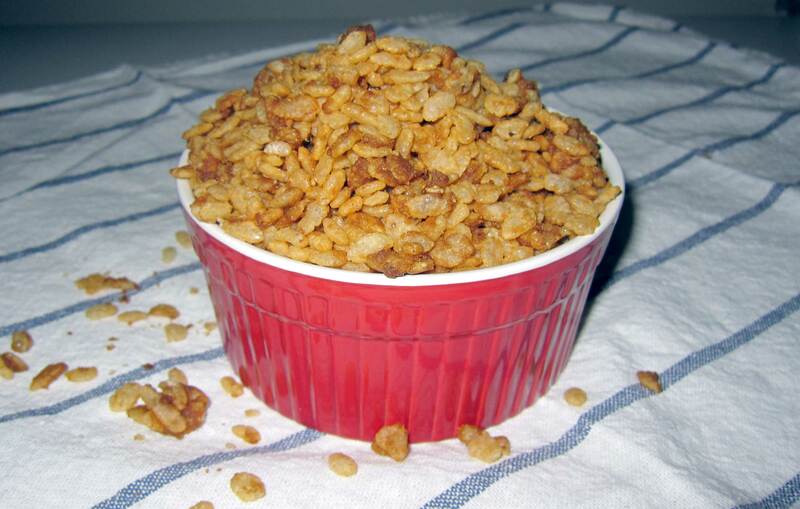 So I’ve been experimenting with different puffed grains that are safe for me. I’ve discovered that millet puffs and some rice puffs are safe for me. Yeah! The old family favorite is back in rotation with modifications and added caramel. Because caramel makes everything better! Add butter and coconut sugar to a large sauce pan over medium low heat. Stir until the coconut sugar melts into the butter. Add the puffs to the pan, making sure to only fill the pan half way. Stir to coat the puffs until all are covered and the puffs have heated through. The recipe scales nicely. The amount of caramelized coverage you get is totally dependent on the amount of puffs you add. Feel free to modify it to your taste. You can omit the sugar and serve as a savory snack. You only want to fill the pan half way. Trust me on this one. With all the stirring, you'll wind up with more puffs all over your kitchen than in the pan. Remove the puffs from the pan immediately. Once the sugar hardens it's nearly impossible to get the puffs out and you run the risk of burnt puff crust on your pan. Ugh! Note to email subscribers: I’m moving my email newsletter over to MailChimp. If you see duplicate emails this week, that’s why. I apologize for the disruption. I’ll remove the WordPress ones as soon as I verify that the MailChimp service is working properly. 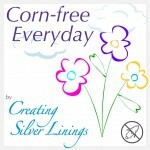 My post was reader favorite on Allergy Free Wednesdays. Thanks readers! This post was shared on Time for a Party, Too Cute, Tempting Tuesdays, Inspire Me Tuesday, Inspire Me Monday, Show Me What You’ve Got, Homemade Tuesday, Good Tips, Meal Planning, Thoughtful Spot, Mad Skills, Recipe Sharing, Made by You, Mostly Homemade, Homestead Barn Hop, What’d You Do, Natural Living, Sweet Sharing, Much Ado, Melt in your Mouth, Block Party, Mix It Up, Motivation Monday, Monday Funday, Sunday Best, Round Tuit, Inspiration Monday, Happiness is Homemade, See Ya in the Gumbo, Real Food Recipes, Clever Chicks, Sharing Time, Marvelous Mondays, Simple Sunday, Sunday Soiree, Wildly Original, Nifty Thrifty, Simple Saturday, Showlicious, Think Pink, Saturday Night Fever, Crafty Showcase, Dare to Share, Saturday Sparks, Get Schooled, Serenity Saturday, Recipe of the Week, Show Stopper, Show & Tell, Check Me Out, Savoring Saturdays, Strut Your Stuff, Best of the Weekend, Party Palooza, Five Friday Finds, Welcome to the Weekend, Inspire Me Please, Weekend No Rules, Inspiration Spotlight, Inspired Weekend, DIY Projects & Recipes, Freedom Fridays, Healthy Vegan, Party Bunch, Friday Frenzy, Fancy This, Anything Goes, Foodie Friday-2, Flaunt It Friday, Eat Create Party, Craft Frenzy Friday, Tempting Tuesday, Friday Flash, Fight Back, Pennywise Platter, Hearth & Soul, Catch A Glimpse, Fresh Food Wednesday, Waste Not Want Not, WFMW, Wonderfully Creative, Cast Party, Whatever Goes, No Rules Weekend, Foodie Friends Friday, Whole Foods Friday, Gluten Free Fridays, Wellness Wednesdays, Homeacre Hop, Full Plate Thursday, Wonderful Wednesday, Thriving on Thursday, Real Food Wednesday, Gluten Free Wednesdays, Wake Up Wednesday, Allergy Free Wednesdays, Tuesdays with a Twist, Tuesday Talent Show, Turn It Up Tuesdays, Tasty Tuesdays, and Totally Tasty Tuesdays. This entry was posted in Appetizers, Desserts, Recipes and tagged coconut sugar, corn free, dessert, egg free, gluten free, refined sugar free. Bookmark the permalink. This looks like a great idea! 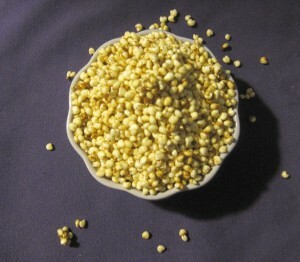 Are you using puffed cereal from the store or are you making your own puffed millet and rice? Thank you for this recipe. 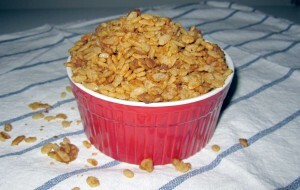 I’m using store bought puffed grains from the health food store. I’ve heard of buying “popping” grains other than popcorn that you can make yourself but I’ve never tried them. What an interesting substitute, it looks really good and I would love to try it. Thanks so much for sharing your post with Full Plate Thursday and hope you have a great week. How interesting! I’ve developed a corn allergy last summer and have been missing all things crunchy (also GF). 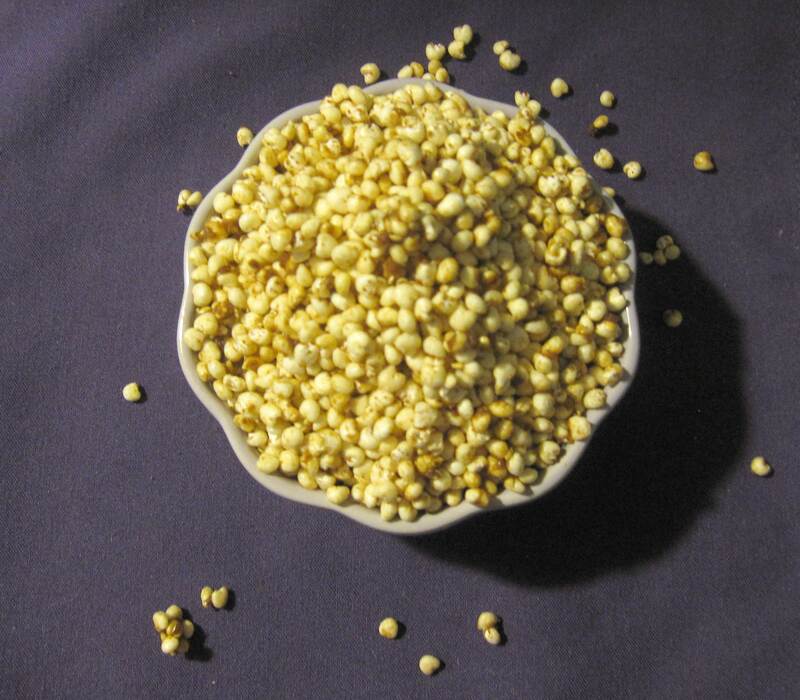 Where do you find millet puffs? I hope you’re feeling better now that you’ve removed corn from your diet. I get millet puffs from my local health food store in the cereal aisle. There is one of those stores right next to my gym. I’ll have to check it out today. I actually go there a lot, but never really looked for millet puffs because I didn’t know there was such a thing. I keep learning new things! And yes, corn gone=feeling better! Yum! Thanks for sharing on The HomeAcre Hop! Hope you’ll stop by and share again today! How do you know you get a corn allergy. Can you tell me more about food rotation. That’s BIG question. It’s my personal belief that corn allergies are the most under-diagnosed allergy in the USA. It’s impossible to eliminate all the corn not only in food, but also in medications, cosmetics, toiletries, paper products, cleaning supplies, drywall, fragrances, ethanol in gasoline, etc… My corn allergy diagnosis was not typical. If you suspect that you have a corn allergy, try eliminating it for 4 days and see how you feel. I’m not a doctor, if you’re having severe problems definitely go see one, but you may have to connect the dots for your doctor and tell them you suspect a corn allergy. Good luck! I don’t have allergies, but I want to try this recipe. Thank you for sharing. My kids would LOVE this. I will have to try it! I’m going to have to give these a try. I’m pretty sure I’ve seen puffed grains in the local Indian/Asian market. Corn allergies are difficult. Corn (or some form of it) seems to be everywhere. Great substitute you’ve created for movie night! I have so many friends who would love this recipe! Stopping by from the Thoughtful Spot Weekly Blog Hop! Thanks for sharing with us! What a great alternative to popcorn. I have a loved one with a corn allergy and it is very hard to work around! This recipe will be greatly appreciated on the next movie night. Looking forward to movie night! I wonder if you add more of the sugar and coconut oil/butter, if the grains will group up into larger, tasty crunchy groups, kind of like Cracker Jacks? You’ll get large clumps unless you actively break them down! Large clumps would be easier to eat but I solve that problem by serving my caramelized millet in coffee cups. Beware! It makes it all too easy to pour massive quantities into your mouth! I have three kids with corn and gluten allergies. The youngest has never had popcorn but the older two Miss it SO much I’ve been trying to find ANYTHING that would fill that void. I’m thinking of breaking up some rice cakes so that there’s a little more to grab (less mess maybe) do you think that would work? Definitely going to try but tips would be super helpful! I wish more people were aware of how prevalent allergies are these days. I’ve thought about the rice cake trick but haven’t tried it. I should work. Whether it will make kids less messy or not, no one can promise that! LOL. I usually serve the smaller grains like millet and rice puffs in a cup so that one can tip the treats into one’s mouth instead of trying to eat by hand. If you do try it, please report back and let me know how it goes. Good luck!